“Beagling” is the act of hunting with a pack of happy beagles, and it is quite a popular pastime in this country for pursuing rabbits and hares. I know for a fact the outdoors just wouldn’t be the same if I couldn’t go beagling, and I’ve been at it quite awhile. I’ve had a lifelong close association with dogs, and when it comes to breeds, owning a beagle or two is actually a necessity in my world, and I’ve always appreciated the beagle’s overall versatility and very amiable attitude. The beagle clearly has an ancient lineage, with many references to small hounds being used by hunters for pursuing hares and rabbits, with the earliest written by Xenophon (“Treatise on Hunting”) in Greece during the 5th Century BC. Small hounds were also popular during Medieval times in England when the upper class made it illegal for the lower class to own dogs large enough to hunt stags, unless the big dog had one of its paws mutilated. Clearly the lower class could legally hunt hares and rabbits which made owning small hounds that could be followed on foot common sense. In the 11th Century, William the Conqueror brought the Talbot Hound to England, which in turn crossed with native hounds. The Talbot Hound was directly related to the Bloodhound and Basset Hound, and today’s beagle possesses scenting capabilities that run nip and tuck with Bloodhounds (I remember when I was on a cross country hike while scouting for deer and one of my beagles managed to get out of my kennel, and it scent-tracked me down on the run just like a bloodhound). The Beagle’s name is most likely derived from the French word “begueule” which basically means baying with an open mouth. “Beagle” was a generic term long used in England for any small hound, and Queen Elizabeth I owned a pack of “pocket beagles” that were small enough to be carried to the hunt in saddlebags. Parson Phillip Honeywood of Essex, England is given credit for developing what we know today as the modern beagle, during the 1830’s. The first beagles began being imported to the United States during the 1860’s and the American Kennel Club (AKC) accepted the Beagle as a breed in 1885. New Englanders created the first Beagle Field Trials in 1890, which are still popular all around the country. By the 20th Century, the Beagle had spread worldwide. Beside hunting small game such as hares and rabbits, Beagles are also used to hunt kangaroos in Australia and whitetails in Ontario (I’d like to try that sometime with a guide and his dogs). The Beagle’s superior scenting capabilities have also found it being used to detect bed bugs in New York City, termites in Australia and by the U.S. Custom and Border Protection Agency for their dedicated efforts, as well as for search and rescue. 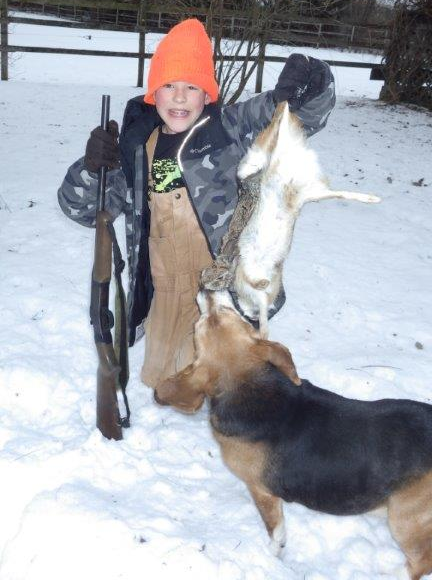 A friend of mine had his beagles even tree a bobcat while snowshoe hare hunting up north. They are very versatile and extremely trainable, to include retrieving applications. These small, short-haired hounds also make great house pets for the entire family and have even adapted well to city life. Beagles generally lack the inherited health issues of other breeds and have strong long necks that allow them to easily reach and scent the ground, and their long ears even assist in gathering scent to their noses. I’ve always used my beagles for pheasant hunting with my Brittany Spaniels as I like to combine the scenting qualities of both. Beagles are ground sniffers and Brittanies pick up body scent while holding their heads a bit higher. It is a combined system that works for me and beagles are great for recovering wounded birds. My beagles also seem to know when we are pheasant hunting or rabbit hunting and act accordingly in the field (they may sound off when a rabbit is jumped while pheasant hunting, but quickly break off and go back after birds. 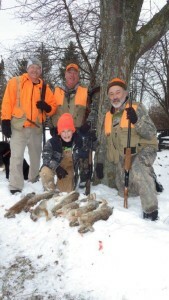 Purely rabbit hunting however is an entirely different matter when it becomes lock-on time. They instinctively know what I’m about). Some years ago, I had female Beagle named “Tiny” that I worked with a male Brittany on pheasants and they were a great team. Although Tiny would sound off while on rabbits, she didn’t make a peep going after pheasants, and if the Brittany locked up tight on a bird, Tiny would honor his point by automatically sitting down close by. I came to realize she was a “sitter” (not to be confused with Setter) which was her way of pointing birds. I liked to use Tiny for December grouse hunting because she was a real dandy at nosing her way through the snow and under overhanging cedar boughs and when she found a grouse, she would sit right down and wait for me to move in. This happened right next to a creek one brisk morning, and while there was snow on its banks, the creek had yet to freeze over with ice. Tiny performed her sitting mode near the base of a large cedar and I moved in and gave the snow a kick and a grouse exploded up and out, and I dropped it out of the air with it falling dead, into the middle of the creek with a splash. Tiny was a great retriever and took right off after the grouse but came to a screeching halt at the water’s edge. When I approached her, she was staring intently at the grouse floating in the deep, dark and cold water. Then she turned her head up at me, looked me right in the eye while twitching her nose from side to side, and she wasn’t smiling, something Beagles seem to do naturally most of the time. It was very clear she was letting me know doing a water retrieve in very cold water on a snowy wintery day wasn’t in the contract. There was no argument on my part because Beagles are obviously quite intelligent and definitely have their way of expressing themselves. I used a dead branch to snag the grouse and bring it to shore, and when it was close enough, Tiny leaned out, grabbed the dead grouse with her mouth and brought it over and dropped it at my feet. She was also wagging her tail and smiling again. It was clear to her we had resolved the situation in a copacetic manner. Needless to say, having beagles as very good friends and being able to go beagling with them whenever possible certainly works for me.